Chapters can start participating in the Campaign for the Future effective immediately. You will be given credit for any new members recruited effective January 1, 2011. Reward Point redemption will be available effective January 1, 2012. Chapter members recruit new NSS members and receive reward points (proportional to the value of the membership level) for each new member who joins NSS. The Point Table shows the specific reward points earned for various levels of NSS membership. These points can be redeemed for rewards. The points awarded for new memberships are around 5 points for every $20 in membership paid. If you recruit higher level memberships (Contributor, Voyager, etc.) you earn more points. Reward Points are accumulated by Chapter code as memberships are processed by NSS Headquarters. Chapters will continue using their existing 3-digit Chapter code as is currently done for Chapter rebates for new members. This code will be entered on NSS membership materials in the Chapter Code section on older materials or in the Recruiter Code section of newer materials. Be sure that the code is on the membership materials your Chapter hands out and that you tell prospective new members to enter the Chapter code if they join online. As the membership forms are processed, this code will be saved in the membership record and used to track the members recruited by the Chapter as well as the chapter rebates due to the Chapter. The Campaign for the Future does not change the cash rebates Chapters already earn from new memberships they recruit. 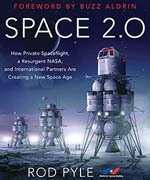 The reward points for the Campaign for the Future are in addition to the cash Chapter rebates already provided by NSS. After January 1, 2012, your reward points may be redeemed for Chapter Rewards. Rewards for Chapters include items such as t-shirts, pins, coffee mugs, etc. which can be used as raffle items or given as prizes at Chapter events plus additional items of interest to Chapters such as program materials, NSS banners and signs, or equipment (even a laptop video projector). Since the Campaign is a multiyear program, you may want to wait longer to redeem your reward points in order to earn a higher reward. NSS membership materials are available to help you recruit new NSS members. Print off the materials you want and put your 3-digit Chapter code in the Chapter Code section of the membership materials. Chapters can also request membership materials be sent to the Chapter from NSS Headquarters. 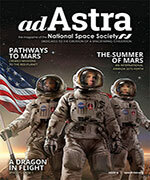 Ad Astra Magazines, NSS stickers and window decals, and NSS membership brochures are available. Participants can recruit family, friends, co-workers, or the general public at public events. Additional recruiting suggestions are also available. Top Chapter recruiters will be recognized at the NSS’s annual International Space and Development Conferences (ISDC). Those Chapters attaining certain levels of recruitment will receive a certificate or a plaque as an automatic reward (which does not cost any reward points). When announced on the Campaign for the Future main webpage, summary reports of a Chapter’s accumulated points will be available from the website. If an email address is provided during registration, quarterly reports will be provided to registrants once summary reports have been announced on the Campaign for the Future main webpage.